What do sites like Job.ProBlogger, WP Hired, Monster, and Elance all have in common? They are all job board sites that have grown rather popular in their perspective niches. Back in the day, building and designing an online job board was very costly and immensely time-consuming. But nowadays, thanks to software like WordPress, creating a job board is much cheaper and easier to get up and running. There are multiple choices within each of these two options that you can choose from to create the job board you have in mind. Below is a list of WordPress themes and plugins and an overview of each one so that you can get an idea of what they have to offer, and then you can go from there. Creating a Job Board with WordPress can be quite the task depending on how extensive you need your site to be. However, with the help of WordPress themes, creating a job board based site that is functional and looks great doesn’t have to be too difficult. The FreelanceEngine theme was created by Engine Themes, and it’s a rather stunning job board theme. FreelanceEngine is the full monty when it comes to creating an online job board. Using the theme you can create a site where people seeking work and seeking to hire can create job posts or apply for certain jobs posted. A freelancer can create a complete profile, search, filter through available projects quickly and easily, and bid on projects that fit their skills and talents. For someone looking to hire a freelancer, they can create an employer profile where they can create jobs, search, invite freelancers whom they like to bid on their jobs, and easily manage all projects from within their own dashboard. Easy to Setup and Monetize | You can quickly install and activate the theme to get things up and running sooner rather than later. The UI Blocks in the back-end make it easy to create page layouts faster than trying to hand-code things on your own. FreelanceEngine also makes it easy to start making money through payment plans that you can create for those adding job posts to your site while limiting the functions of any free plans you setup so that you can gain traffic without completely losing income in the process. Front Page Video Background and Simple but Modern Front-End Design | The front page of the theme supports video, which is a nice touch for creating something unique. The end result of how your site will appear to your visitors is easy to navigate but not so simple that you end up with something painful to look at. Built-In Localization Support and Mobile Ready | Live somewhere outside an english speaking country, or you want your site ready for mobile views? The theme’s got you covered. The price for FreelanceEngine is $89 for 12 months of support and updates, but the price is cut in half if you decide to renew. They also have tutorials and documentation for helping you get started with the theme. If you have questions about the theme, you can also get in contact before purchasing it so that you can figure out exactly what you’re getting into. Want to get a feel of what a viewer will be experiencing when they visit the site? View the demo to on Engine Themes. JobEngine is yet another full-fledged job board theme by Engine Themes. It is similar to FreelanceEngine, but it’s a bit more straight forward as far as job boards goes. Unlike the theme listed above, JobEngine is more for creating job posts, although, you can still create what is called a Professional Profile where you can list your job title and upload your resume so that future prospects can find you and take a look at your skills. Don’t want to create a profile? No worries. Freelancers can visit the site, view, and filter through the listings, and apply to the jobs — no profile needed. Simple Interface and Front-End Control | The interface with JobEngine is simple and without all the bells and whistles that you’d find in the other theme by EngineTheme, however, it’s by no means an ugly looking interface. The front-end controls are also a nice feature; users can create, edit, and publish content without a being taken to the WP Dashboard which creates a fluid experience for your users. Easy to Setup and Monetize | Like FreelanceEngine, you can easily install and setup your theme (configuring everything is obviously going to take time though). Monetizing your site is also easy since you can create pricing plans for job listings and take payment online. Design Tools | The theme comes with a unique design tool called the Adaptive Color Scheme that allows for easy and striking customizations to the look or the theme. Email Templates and Payment Gateways | Offer job seekers the options to sign up to the most recent jobs posted to the site or to receive a reminder to apply to a job that they didn’t have the time to fill out while they were browsing the site. Use payment gateways like PayPal or Google Checkout to allow fast and painless payment for using your job board — talk about easy-peezy. Price for this theme is $129 for 12 months up support and updates (just as a note: this theme is updated weekly in order to continually better the end product). You can view both the front-end and back-end demo of the JobEngine theme so that you get your hands a bit dirty before diving in and purchasing it. WPJobus is similar to the others on our list as it is a standalone job board theme(meaning no 3rd party plugins are needed), however, the design is vastly different and may be closer to what you’d like for your site. The theme boasts being a 3 in 1 theme which offers a full-fledged job board, and impressive personal or company profiles. Prefer to not create a job board just yet? Then you can simply use it as an appealing one-page theme that contains your personal or business profile. Multiple Input Options for Profiles | 100+ input options for a personal resume, company profile page, and job ad details. Design | Flat, modern, and responsive design to keep up with the design and web surfing trends of the day. It also has unlimited color schemes and custom shortcodes at your disposal. Simple Monetization | Start making money with your theme; PayPal and Stripe payment gateway ready. You can also request payment for featured jobs or profiles (both personal and company) in order to increase your revenue. Translation Ready | Multi-language support and extensive documentation and theme support. Everything Takes Place in the Front-End | Users can create an account, fill out their resume, create company profiles and apply for jobs in the front-end of the site. Additional Feature | Includes the Layerslider plugin in purchase. This isn’t a comprehensive list, but it does give some of the main strengths of the WPJobus theme. Price for the theme is $58, so it’s a cheaper theme option. 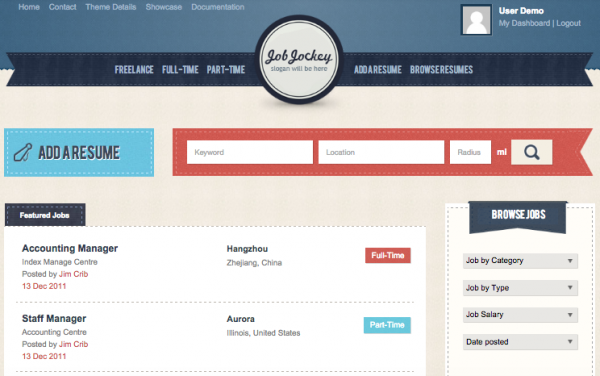 Job Jockey is a responsive job board theme by ColorLabs. The visual design of this theme gives a very retro vibe, but outside of strict visuals, the theme has all the basic functions for creating a WordPress powered job board. Visitors to your site can register as either someone looking to hire someone or someone looking for work. Both a job seeker and an employer will have their perspective dashboards where they can view their job posts or which jobs they have viewed, liked, and applied for. Job-seekers can easily sort through the ads by using the filters in the sidebar in order to help narrow things down. Employers can also search through the resumes (personal profiles) to help them find the right person for the job. Instant Notifications | Employers are notified instantly when someone applies for their job post. Seamlessly integrates with PayPal | This means that you can set up your site to take automatic payments so that you don’t have to handle it and free up your time a bit more. Custom Forms | Create custom forms for each job category so that the details given are a bit more informative or unique. Job Monitoring | View the stats of your job board and calculate how much money you’ve made in a 30 day period from within your WordPress Dashboard. Many of the customizations that can be made in the theme take place using the front-end WordPress Customizer, so you don’t have to dabble too much in the code to get something a bit more unique. All and all, the theme offers the basic features, but it’s not as expansive as some other themes. The layout and interface on the front-end are something that people are used to, and its simplicity could be a better suit for what you’re planning to create. Price for the theme is a one-time payment of $79 and includes a lifetime membership with purchase. You can view both the demo, dashboard, and WordPress Customizer options on ColorLabs site. To round out the themes on our list, I thought this might be a nice change of pace. The themes listed so far can do very well for multiple types of job board, but the responsive Babysitter theme by Dan Fisher on ThemeForest is bit more niche specific. 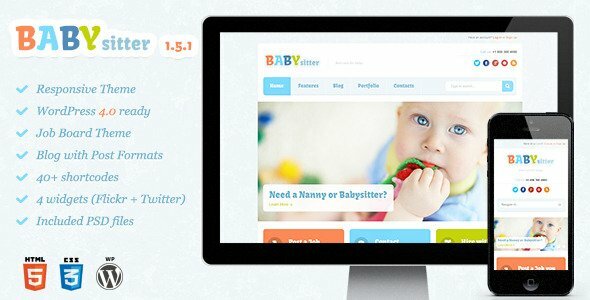 As you could guess by the name, Babysitter was a job board theme designed with babysitters and nannies in mind. The theme has very feminine feel to it and could double as a mom blog or something along those lines. Unlike the other themes mentioned, Babysitter needs the WP Manager Plugin in order to create a job board, however, the plugin is free to download so you don’t have to worry about paying more money for that aspect of the theme (more on this in the next section). Easy Customizations | The theme options and styling tab in the back-end of your site allows for simple changes, including options for choosing any color to use on your site and access to all 500+ Google Fonts. You can also make a large majority of the visual customizations in the WordPress Customizer in the front-end of your site. FontAwesome Icons | In addition to the customization options, you also have access to the 360+ FontAwesome icons to use in your designs. Price for the theme is $48 and they offer free support after purchase of the theme. Is a WordPress Job Board theme not exactly what you’re looking for? Then a WordPress plugin may be the best bet for creating a job board site or integrating a job posting board into your current site. Here are a few options to get you started. If you’re looking for a job board plugin that really pulls out all the stops, then WP Job Board could be exactly what you need. One of the best features about this plugin is that, according to their site, it integrates with any and every WordPress theme. This is perfect if you want to create a job board on your site but don’t want to switch out your theme for something like the ones mentioned earlier. Control of Job Posts | Take control of who posts on your site and what they post to the job board. Easy Monetization Options | The plugin integrates with PayPal and Stripe to make taking payments on your site easy. You can create membership packages, add paid job listings, and charge for employers to see the full details of resumes of profiles on the job board. Job Listing Syndication | One of the more unique features of WP Job Board is that you can use the plugin to pull job listings from sites like Indeed, CareerBuilder and LinkedIn. This is by no means a comprehensive list of everything that the plugin can do but it is definitely a powerful plugin that is worth consideration depending on what you’re looking for. Price for WP Job Board starts at $97 for use on a single site and for a year of updates and support. You can view 3 different demos on the plugin’s site including one of the admin panel so that you can get an insider’s look of what using the plugin in your Dashboard would be like. The Jobs and Experts plugin was created by some of the minds behind WPMU Dev and was released to the world a couple of months ago. Even though the plugin is new to the market, it’s sure to catch some attention due to its features and visual layout. The name of the plugin lends to what it does and how it can be used. Using the Jobs and Experts, people can come to your site and post jobs or personal profiles, and if you prefer, you can configure things so that your site does only one or the other. The listing layout of Jobs and Experts is clean and intuitive, but if you’re wanting something a little different then you can use the custom layout options to change things up a bit. Job-seekers can search for job ads using a keyword in the search bar or they can use that Advanced Search options to narrow things down. 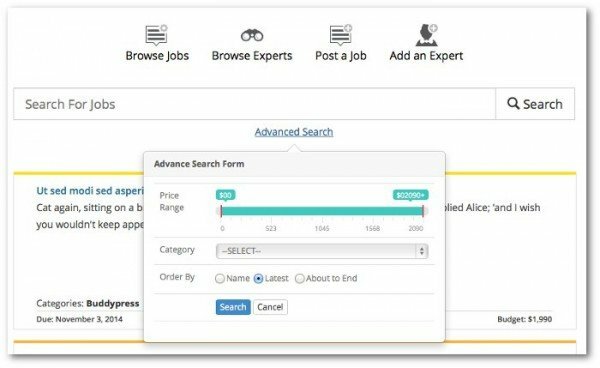 Job-seekers can search for job ads using a keyword in the search bar or they can use that Advanced Search options to narrow their search down. Adding Jobs | Adding jobs to the board can be done by the admin in the back-end and by a user in the front-end of your site. Jobs also have a contact form which can be used to contact prospects and the plugin even allows for adding downloadable files. Personal Profiles | The profile page that a user can create is easy on the eyes and lets them add details where they can show their chops. They can add skills, social profiles, and sample files so that prospects can see if they’re a good fit for the job. No back-end access needed here; all profile content and editing is made in the front-end. Messaging | You can add-on a messaging system that lets employers and experts (or job seekers) discreetly communicate to each other. The plugin is being used on the WPMU Dev site under the Jobs & Pros section on their site, so you view it live to understand how well the plugin really works. As far as price, it’s a little on the higher end of things. It starts at $19 for a month of support and updates. As an alternative, you can pay for a full year of support/updates and gain access to all the products on WPMU Dev’s site. Looking for a free solution to adding a job board to your site? Then this is plugin to beat. WP Job Manager contains many of the same features as the other plugins listed above and it even boasts being a light-weight plugin, so it shouldn’t dramatically slow your site speed. Creating jobs and resumes is easy for visitors since both take place in the front-end of the site. Much like WP Job Board, you can also syndicate job posts from Indeed.com. And since shortcodes are used to create your job board page(s), the plugin will work with any WordPress theme. Job Filters | Lets users search or filter options on the job board so that they can find and apply to jobs faster. Preview | Users posting a job can preview their ad before making it go live. Manage Posts and Profiles | Manage all the job posts and profile on your site in your WordPress Dashboard. On the other hand, visitors to your job board can create a personal profile in the front-end, and employers who are logged in can manage (view, edit, and delete) their job posts on their own. Add-Ons | Extend the power and functionality of the plugin with add-ons like Job Alerts or Simple Paid Listings, which are available on the plugin’s site. The plugin doesn’t come ready to take payments in order to monetize right out of the box, however the add-ons available can remedy that. The visual design of the job board is simple but still nice to look at. At the very least, you can give the plugin a test run before opting in for something that you’ll have to pay for. At the very least, you can give the plugin a test run before opting in for something that you’ll have to pay for. So which is better? A theme or a plugin? Well, that is largely going to depend on you and what you’re wanting to create. If you’re starting from scratch in creating a Job Board site, a standalone theme could be the right decision as it would eliminate the hassle of finding another theme and trying to code a plugin with the functions that already exist in another WP theme. However, if you’re wanting to create a site that just so happens to have a job board on it, then a plugin could be the best choice. Out of the 3 plugins mentioned, WP Job Manager is probably the best place to start since it is a free plugin. If it’s not what you’re looking for, then you can move on to something a little more robust. Either way, it’s important to figure out what you want to create and then explore your options from there. WordPress has some impressive solutions for creating a job board, but what one person likes another may not. Have you used any of the products mentioned above? Have you tried another one not mentioned on the list? What did you think about them? I love this post, thank you so much We were looking into a niche project related to baby-sitting and the one you posted here from BabySitter is awesome. Saves so much time rather than having to hire a developer for this. One more reason why I love this blog and wordpress. Babysitter was pretty cool, wasn’t is? 🙂 I really liked it the moment I came across it, but I’m glad you found it useful! I wonder how to promote a website where will be posted only wordpress jobs. Maybe u have some thoughts. Thanks for sharing your thoughts, WP Job Manager is i think best for those who don’t want to spend a PENNY. its free with frequent updates for its author. Thanks for such a great selection of job themes. I thought of just setting up on a site with a plugin, but I can see that a whole theme solution is certainly worth more thought. Thanks Ariel, as always your posts are interesting and very comprehensive and this article is no different! I’ve built my own Job Boards in the past but will certainly consider of of the above next time, if only to speed up development. I do prefer to have control over the theme so I’d prefer a plug-in or building my own. Just an idea, but is there any chance of actually you know, producing some themes? We are always working on a new themes, and our writing team is not at all connected to your development team. You can learn about what we are working on in the Theme Sneak Peeks category. Nice and very thorough. WP Jobus is very impressive! Thanks for the pro review. I think app theme is good, It has the consistency between design and business. Awesome. Though I just did a project with a embed code from the paid recruiterbox.com client account. JobEngine is a very good theme, but I don`t say “no” to Wp Job Manager” xD. i’m currently using wp job manager + Jobify and works perfect!!! Hello. Do any of these plugins work as an aggregator and allow you to pull data from already existing job sites to your own website? You will need a hosting plan and a domain to get started. I’ve decided to go with the WPJOBUS which looks like a good option, I’ve already got my domain and hosting sorted now just to buy the theme and upload it. However one question I’m going to offer employers a free trail and not offer the CV search until I have enough CVs however do I need the additional plug in WPJOB as I want to charge for employers to advertise, have a featured job ad and charge for CV search!. This is my Christmas project! Also one more question does any one have any tips on marketing to promote a job board apart from creating a page on LinkedIn, Facebook, twitter and also advertising on the search engines, does putting a blog on your site help? I don’t want to rush things as I don’t need to I want to take the approach to build it and slowly get new business and candidates registering CVs. I second what Loker Batam wrote. Q. how does Divi interact with WP Job Manager and WP Jobboard, both are plugin that can be used with any theme. Kudos for the good post. I certainly feel that solutions like WP Job Manager and Jobify goes a long way in helping individuals create online job board solutions around WordPress.